Get your paws over to a bookstore and check out LUXURY FOR CATS, a fantasticat coffee-table sized book (it's even big for this Mighty Meowster!). Author, Patrice Farameh has compiled cats, cats and more cats - but not just we fantastic felines purrfectly profiled as the creatures of habit that we are. You'll see we kitties richly luxuriating here, there and everywhere, and it's in 5 languages too, but she forgot some of us speak Cat Chat - that would have made 6 meowvalous languages!! Sneak a peak at the book : it's me meowvalously lounging luxuriously. Four Paws up for my PURRsonal photographer Mark Rogers who catapulted my feline face to not 1 but 3 photos in the book's Travel section! He's so good - I'm not even air-brushed! This pawsatively fun photo shoot took place at San Francisco's Pet Camp Cat Safari - it gets a Baby Bengal sized Four Paws up in the Guido Global Awards and it should be in the Zagacat and Michelin guides too! Move on over InterCatinental and Ritz Carlton ... ya ain't got nothing for we cats who want to luxuriate! 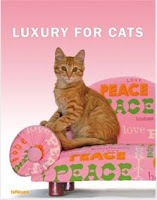 You'll have to buy the book to revel in the other fantasticat shots and you'll be wishing you were a luxurious cat too! For centuries, way before Julius Caesar's Cat excelled in shredding Roman togas, it's been said that we cats are up to our whiskers with curiosity. Pawsatively true and I was doggone (oops!) I mean PURRfectly ready to be the inquisikitty to learn how eggs are white for one catnap and then bursting with colors the next. My meowster self now attests, it takes a lot of patience to flip and dip Easter eggs using 4 paws, and imagine me the mighty meowster deliCATly dropping the kitten sized color tabs into the inky dinky cups (wouldn't even hold a good lick of milk!) . But being a purrfectacat, I attacked this project in fervent feline fashion ... even did a paw test to assure the color was dry before setting out to begin my feline frivolity with my new 'roll the neon egg' set. Egg can appear to be dry (in your rear view mirror or in real life) ... but catzowey, it's not! This is definitely not a meowvalous moment for the mighty meowster - imagine me with abundacat colored kitty lips - pastels too! I got news for you: if it's not my Italian feline flag colors - FURget it! Here's hoping your St Patrick's Day is nonCATastrophic. I PURRpose you wiggle your whiskers and catch a little legendary leprechaun. Oh kitty O'Zowey and top O' Catnip container - I'm in full feline Irish spirit and my Emerald Isle fantasticat green eyes are smiling and searching for the wee ones. Got the green scene going here (oh no no no, a kitty kilt is not in the cat cards, don't even think about that!) 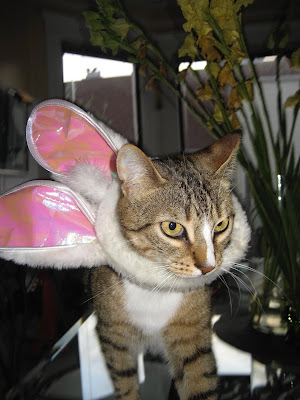 - I'm Guido, the Italian kitty in catnito and nobody will know I'm not really Irish. You know I'm an envirocat and pride my paws in being GREEN every day, but today I'm really wrapped up in it. I swear on all of my 9 lives, everybody has a little Irish in them - makes us PURRfect they say! The votes are tabbylated and Catzowey thanks to YOU for your pawsatively purrfect vote when you told San Francisco's 7x7 Magazine your favorite pet photo was #13. View the fantasticat feline dynamic duo's mighty meowster pic in this month's 7x7 magazine so click on it and smile. It's a meowvalous moment and paws UP to you for your votes! Catzowey - it's fashion show season and super models are strutting down the global runways decked out by meowvalous designers. I'm in to looking good so I've opted for a kitty couture fitting for my new "San Francisco SPCA Animal Assisted Therapy" vest. Oh yeah, it's got a comfy cut on the bias ... or am I just biased because it's from my special SF SPCA? Hmmmm, where's my tabby tailor to fix my feline fashion? The ruffled fur-look and jackets are PURRportedly IN this year and hey... my fur ruffles any season if I'm rubbed the wrong way. It's utterly meowvalous to check out and get decked out in the all-reason-any-season wrap which is enviromenticatically correct: it's green!